It started quite innocently, as affairs often do. 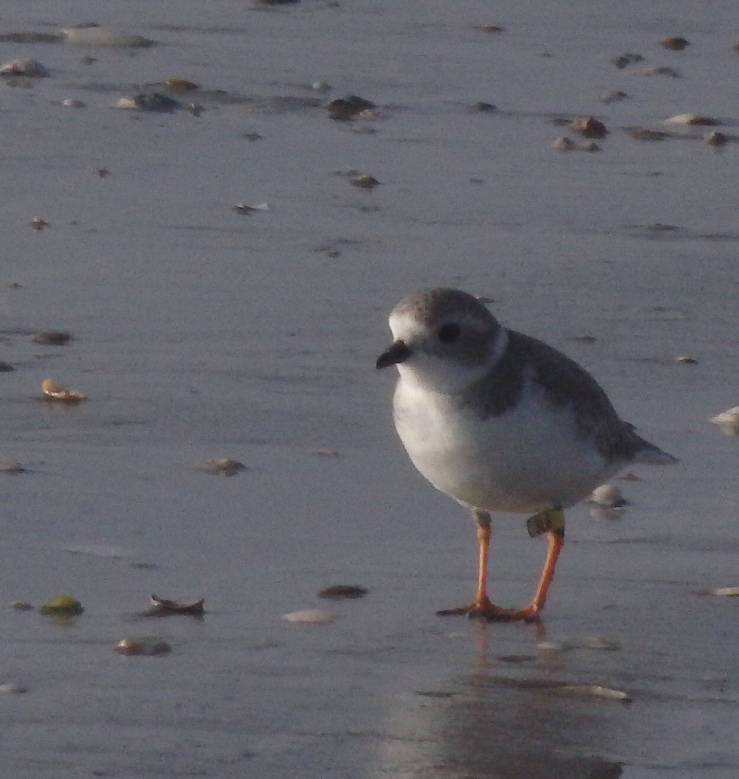 The winter air was crisp and I walked along the beach, camera in hand, randomly snapping photos of Piping Plovers. In retrospect, there were probably also some Snowy Plovers but the Piping Plovers with their yellow-orange legs and impossibly cute Buddha bellies were my goal. My camera was a little point and shoot which took pretty decent photos. At some point I realized that one of “my” Plovers was sporting a yellow flag on his upper leg. The hunt then became more focused as I took seemingly hundreds of blurry photos in attempt to be able to read the three digit code emblazoned on the flag. That evening when I downloaded photos I had somehow forgotten about the drama of the morning’s chase. I inwardly groaned at the number of shots I needed to go through. After about ten minutes I realized I had a keeper. A photo in which I could read the code clearly: J97. So, now I could read the code and knew that somewhere someone would be happy to receive the info. After much research I found a site that would help me out. I carefully entered all the required info and sent it off. Two days later I received an email telling me where he had hatched (near Tappen, ND) and where he had spent the previous summer. I was hooked. I saw J97 many times that winter and reported each time. More tagged birds were seen and their info was also reported. Summers found me in Maine, monitoring Piping Plover nests and proudly watching chicks hatch and fledge. Part of that volunteer job is education and seeing the looks on people’s faces as they first discover those tiny fluffballs in the sand makes every second of my commute to the beach worth it. I often see banded Piping Plovers on my beach walks here in Galveston. They have all turned out to be from North Dakota. Last week I was doing a bird survey with another volunteer when we spotted one. The blurry photos were taken using that same little camera and that evening I checked my records to find that 3L6 was a bird I had reported in April. He was banded in 2015. My affair was once again justified. If you take a photo of a banded plover, please share the information. The species has a total population of about 12,000 and with help their numbers are starting to increase. Go to the following link and you will find all the information you need to start reporting! https://www.fws.gov/northeast/pipingplover/report_bands.html Just beware. You may start your own affair!